Rated 5 out of 5 by 0Jade from Very well done! Someone has figured out how to manipulate water in graphics beautifully. WOW It's worth playing the demo just to see that. This one has all you are looking for in the way of a Collector's Edition game, the guide, lots of collectibles, bonus game and all the whoopdedoo freebies. The game itself has an interesting storyline, hidden objects, but not too many of them, jigsaw puzzle for those more inclined away from HOGS - leans more toward the adventure side, a navigatable map, customizable difficulty settings and an new feature to manipulate water. As much as you will be disappointed that I didn't find out any more about this game, to be honest, I was too busy playing it. This is one game that was over before I was ready for it to be. I was minding my own business playing the game when WHAM - it was over. I hate it when that happens... but that usually means I've got to get this game. Enjoy. Rated 5 out of 5 by pennmom36 from FEAR FOR SALE.....One Drop At A Time! Your skills as paranormal journalist will be put to the test on this case, for something, someone is able to manipulate the water. Julia White witnessed something at the hydro-electric plant but never made it back alive to report her findings! Now she is desperately trying to warn her family of the eminent danger from beyond, who or what killed Julia White and why is her entire family at risk?.......There are ton's of extra's on this Fear For Sale, 36 Beyond objects to find as well as a bunch of achievements available to earn. If you love games with collectibles you are in for a huge treat because there are 7 different types of collectibles, and there are several items available in each category. There are Spa Gift Basket items, Make Up Essentials, Heirloom jewelry, Afternoon Tea items, Greenville souvenirs, Conchologist (shells) and Antique Dolls to collect! The Hidden Object Scenes are interactive such as picking up bouquets of different colored flowers and placing them on top of the matching colored gnomes heads that are actually flower pots. If you don't like HOS, there is a jigsaw puzzle available instead. I haven't come across any difficult mini games yet, most are easy and most are fun. The game I liked the best was sliding tiles along a grid and using other tiles to block their paths until the tiles line up and into their correct slots. You will receive a Conch shell from the beyond that will allow you to manipulate water, removing water from some areas and even to put out fires. Every collectible you find and every beyond object gives you points so you can compete against friends but I can't see that happening, enjoy! Rated 5 out of 5 by LosAngeHell from Digital Thumbs Up on this Game Go for it. Definitely the best game this month. I liked it and recommend it. Rated 5 out of 5 by Nilosh from Bring Your Galoshes, Its Fun in the Water! As paranormal journalist, Emma Roberts, you are called upon to investigate a strange water-based paranormal activity that has plagued the town of Greenville and may have caused the death of Julia White. On arrival to the White’s home, you discover that there is indeed something suspicious about Julia’s death as her watery image seems to be haunting the family. There is also a mystery that involves the hydro-electric plant and somebody will stop at nothing to keep in under wraps. Your adventure begins as you tackle ghostly images and follow leads that hopefully will end the watery threat in Greenville. Once again the developers have brought us a new and exciting installment to this ever so popular series, Fear for Sale. The opening scenes with live actors and excellent animations had me hooked to the story and as I began to play the demo, I was not disappointed with the game so far. With three modes of difficulty to choose from, you also have customized settings to suit your own preferences. 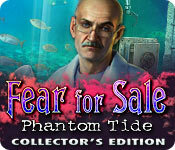 Phantom Tide is a standard HOPA game with extras that make it a collector’s edition. Sharp graphics and life-like images along with excellent special effects enhance the overall gaming experience. I really liked the life-like characters and thought that the voice-overs were very well done. Animation scenes are crisp and the music adds tension to the storyline. Game tools include a journal, a map that allows for travel and a conch shell that collects water traps throughout the game. There were standard Hidden objects scenes that were somewhat over crowded with a list of items to collect; some required interactions. You also have the option to switch over to a jig-saw puzzle which personally I enjoyed as I am a fan of jigsaws. 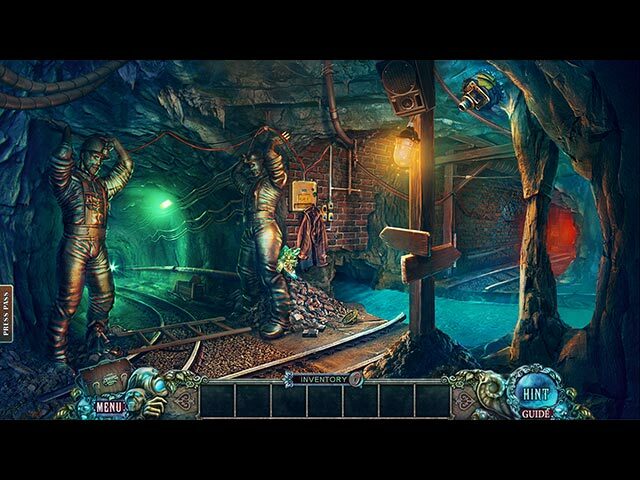 Adventure game-play involves solving puzzles, collecting items and applying tools while visiting each scene. I especially enjoyed some of the mini-games, not especially difficult, but some were actually very well conceptualized and fun to play. I do however miss the more intricate puzzle and would like to see developers use a bit more imaginations when designing mini-games, making them more challenging; nevertheless, I thought that some of them were well executed. Extras include a series of collectable items which are scattered throughout the game. There are also morphing objects to locate, forcing you to look closer at the scene which also gives you the opportunity to really appreciate the artwork in the game. With every item that you find, you get a press pass card popping up at the side of the screen that gives you points for items found. I really enjoyed the demo and will definitely add this to my collection once I pay up my credit card. As always, games do take a toll on my wallet so I will probably take advantage of a CE sale. I do thing a round of applause to the developers is warranted for keeping this series going and making each game equally good as the predecessors. Well done and have a great week-end everyone. Rated 4 out of 5 by eponym from Thoroughly Enjoyable I replayed this and found that it was more enjoyable than I remembered. The game was paced well with the perfect mix of HOS and puzzles. The scenes were varied and interesting. I enen liked the bonus round which did not seem like and afterthought! Rated 4 out of 5 by dcgvmy from Fear is fun I thought this game was fun like the previous fear for sale games. It was a good game but it wasn't as fun as "Fear for sale: Nightmare Cinema". I wonder if any of the next fear for sale games will feel like that? Rated 4 out of 5 by krystal59 from nice balance For me at least, this game had the perfect balance of HO scenes, adventure play, puzzles and collectible stuff. It had lots of all of them. I loved the collections of collectibles and the morphing objects. Could have used a few more achievements but what was there I had fun with. There was also a conch that you use to control water. I liked the storyline.. a woman has been murdered.. or was she? The police only found parts of a blown up boat. Ever since this incident the family has been having water problems in their house and the child can hear her mother's voice in it. What is going on? Interesting storyline that flowed quite well. I also like it when the main character speaks throughout the game. Makes it more interesting and I never forgot why I was there or what I was doing. I found the VO's pretty good with the exception of the husband sometimes who's voice seemed a tad flat and emotionless considering the circumstances. The graphics were beautiful. I liked the skies in the beginning and the water by the dock in the bonus chapter was especially well done. There was one scene where the water takes a human form and conks the two bad guys out cold. I must say that made me lol. I like it when the search for collectibles and morphing objects are carried over into the bonus chapter and it was for sure necessary to the story. Thankfully no one went missing in this one and the whole thing was very well done. Overall I quite enjoyed this game. Rated 4 out of 5 by hazelwize16 from AN OVERALL GOOD TIME WITH WATER! great concept ... hos were relatively fast ... the puzzles fun and the artwork was once again excellent ... i think this is the one where there was one glitch in the early in the game and i had to start over to compensate but i enjoyed the game thru the bonus gameplay ... i especially enjoyed the MUSIC during the hos ... and love the music at the end with the credits ... worth the purchase and the time! Rated 4 out of 5 by sportygal2009 from Feedback For Developer Only 3.5 Stars Review Of Completed Game VISUAL/SOUND QUALITY: I really liked the graphics and the cut scenes. I thought you did just fine here. The voice overs I thought were really good. The music started out really good for me however getting more into the game and even into the bonus ended up being pretty much the same music so I ended up turning that down. LEVEL OF CHALLENGE: While I didn't use the hint/skip (or even map/strategy guide) I do thank you for providing a custom mode that I could set the hint/skip at quick charge up because I do like to have those available just in case needed. Also thank you for no sparkles. However I couldn't find a way to turn off the black bar tips telling me what needed to be done in the game. I do like to try and figure out on my own first and then if I can't I'll use the hint/skip button so I do think the game could of been just a bit more challenging. Please address the black bar tips in your next game offering. I did like the HOS the interactive word list. I'm a fan of these. The puzzles/mini games I'm not a fan of this. Less the better. Having said this I had no problem completing any of them but just too many for me. I prefer games more on the adventure/HOS side. (more adventure though). While I found some back/forth to this game the "adventure" side was pretty light not having to travel too far. I never got lost in the game. STORYLINE: While yes it's pretty much been done before but haven't they all? I mean even TV shows/movies have all pretty much been done before in one way or another but yes I do hope you along with the rest of the developers try to come up with something new. Having said this... I did enjoy this one. It kept my interest from beginning to end. As for the main story ending I do have mixed feelings here. I thought it ended somewhat satisfactory meaning I was there doing what I was meant to do and accomplished that. However, if I REALLY wanted to know what Julia was doing and how it REALLY ends, I would need the bonus chapter for that. I also thought the bonus chapter should of been all new locations. There were a couple of new ones however most from main game. THE CE EXTRAS: Achievements/collectibles there is definitely a lot here to offer. I'll definitely admit to once being a huge fan of this but now I just find it distracting. It does seem that now that I'm no longer a fan of this I seem to achieve/collect more than when I was a fan! LOL! I did find it a bit distracting in this game popping up pretty consistently that I had "achieved" or "collected" something! All I want from a game now is a good/great story and game play that will entertain me for at least 4 hours as I said in one of my last reviews. Hopefully you can find a way to shut this off for the people who don't much care for this and of course keep for the people who are really into it. Oh and as for wallpapers, music concept art I will admit to using a few wallpapers but definitely not a must have for me and I've never used concept art/music in any game. The strategy guide I've used for a few games and will say it's nice to have with the game in case needed. FUN FACTOR: Overall I liked the game. There is quite a bit to do and places to go. This is sure A LOT better than the last few games I've played on here. The game length was just right for me as the main game was 5 hours and bonus chapter 1 and 1/2 hours. This is definitely long enough for me. I also had no tech issues with this game. Also while I'm not into "helpers" I did like the sea shell! Thanks Developer. Overall I thought you did a pretty good job. You get 3 1/2 stars from me. Since there is no 1/2 star I rated you 4 stars since this was A LOT better than the last few games here and kept me entertained as I said. Rated 4 out of 5 by Tiger2010 from Great game but needs a bug fix WHOLE GAME AND BONUS I love the Fear for Sale games, precisely because of the different take on collectibles, all of the beyond objects and the alternative jigsaw puzzles with their weird and wonderful shapes. Undoubtedly, I'd have loved this game even more if it wasn't full of technical problems. More on that later. Others have already summarised the story and I'd only give it all away if I went further into it. Suffice to say, Julia (wife/mother) is missing, presumed dead and someone is determined to keep a lid on things. You, of course, are called to investigate. Not much new there. The 'good' and nitty gritty, I guess: - Water graphics are very well done and the animated characters are a good representation of their real life counterparts, whom we see acting in the cut scenes. 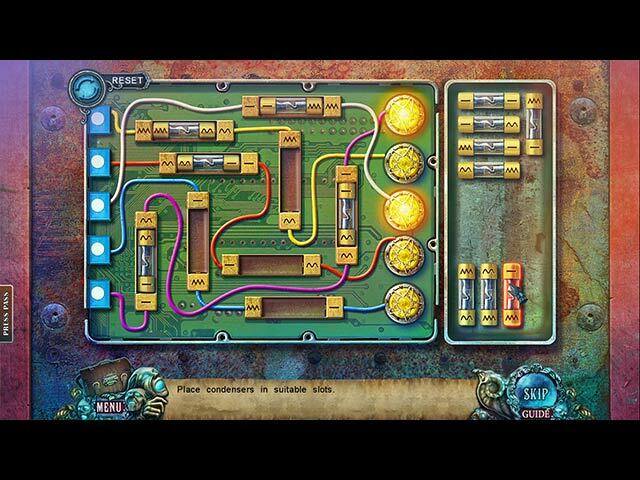 - 28 Puzzles with easy to medium difficulty which are nice variations on the usual. - 30 HOPs which are all lists with some interaction. You can play some neat jigsaw puzzles as an alternative. Those still count toward your HOP achievement. -35 collectibles of 5 each in 7 categories and 36 morphing 'beyond' objects which aren't too hard to spot, with 1 morph/1 collectible in almost every scene. - 10 achievements based on performance and storyline. - Achievements, collectibles and beyond objects carry over to the bonus play. - You collect 'experience' points for successful completion of HOPs and Puzzles which move you up the detective ranking system to achieve the ultimate "Legendary" badge at the very end. - Jump map that is fast and easy to follow. The main story ends in part satisfactorily. A crime has been solved. That's what you were there for, after all. However, if you really want to know what Julia was doing and how it [b]ultimately[/b] ends, you will get that in the Bonus, which may divide players. The Bad: I had to play this game again from the start FOUR times to work my way around a bug in one HOP (I recommend checking out the threads in the forum for this game for the solution), and this wasn't the only problem for many gamers. I still recommend this game. The bonus played without a problem and I thought that alone was a good game, though it does revisit the exact same first 5 or 6 scenes present in the main game and in the same order to start. With a fix to cure all the tech problems people are having, this isn't a bad CE. I'll give it 3 1/2 out of 5, which would have been higher if the first hour hadn't been such a groundhog day nightmare. Rated 4 out of 5 by tesamoine from Unique Story Phantom Tide is a great story line. Something different, more or less. I enjoyed the previous Fear for Sale game, but not the first two. I found this game to be ok. The HOS were basically junk piles. The puzzles were fun and interesting. I found them difficult, but then, I'm not a huge puzzle person. The voice overs were great, although the characters were a bit "wooden". There are achievements and collectibles galore. I will replay this for a bit when it comes out as an SE as I'm not real big on all the morphine objects and collectibles. Half way through the demo, I was losing interest. However, could just be the mood of the day. I do recommend the game. The map does have a lot to be desired as does the SG. I never use the in-game SG, but did check it out and it was very rough. The map was vague. This is, however, a fairly linear game, so that shouldn't be a problem. I loved the water effects and the conch shell. Very well done. The sale offered today does nothing to make me want to purchase the CE, as I already own the other games. As a member of BFG, something different should be offered as most of us who play these games do own the more popular games already. Rated 4 out of 5 by dancemom1 from Not quite as fearful! Hello all. Well, another addition to the Fear for Sale series. I have the first 3 and enjoyed them all, with Nightmare Cinema being my favorite. Colors are bright and fairly clear, graphics aren't bad, but not as good as the last one. Game play was good, no problems at all. Music was nice, even changed with whatever was happening in the scene, which makes a game more "edge of your seat." Voice overs were pretty good, but not a lot. Sound FX are very nice as well. This one has a combination of animation and "real." I much prefer animation in my games, but that's my personal preference. SG left a lot to be desired. The directions were not as clear as most, e.g., "walk down twice and use pruners"...on what, where? "Walk down and place map here"...where #should say enter car and place map#. It leaves a lot to your memory. There is a map, but the pictures are very blurry and you have to play a while before you get it. There is a lot of running back and forth for one item here and one there, so be ready to travel a lot. You collect a shell that is quite helpful "manipulating" water, which has to be done 13 times, but it lights up when you need to use it. The waterworks in this game are very well done. There are a lot of achievements, as usual and a pile of collectibles. I'm not sure what the "legendary" is, but you need to find 7 and I found a few. You also have tea party, jewelry, make-up, dolls, shells, etc., which are not difficult to see, you just have to remember to look. There are also 36 morphing items, which seem to stand out pretty well. Having multiple items to find makes a game more challenging and fun. HOGs are pretty standard and items are not difficult to find, but some are very small. You can switch to a jigsaw puzzle if you don't want the HOG, which I really like, since I am a major puzzler. Puzzles are very simple so far. Hint system is helpful but fills very slowly. The one thing that will make me buy this game, are all the collectibles, not the story. Even with a very disappointing SG and map, I liked this game and will buy it to add to my ever growing list of games. I think this game will appeal to all levels of players. As always, try it for yourself and see what your think. We all have different tastes in games and you may not care for this one at all. Thanks for the reviews. Rated 4 out of 5 by JustTheFacts from Good Solid Game BASED ON DEMO FIRST IMPRESSIONS Very professionally done, the intro scenes are different – there’s no car crashes, or other explosive arrivals, just the weirdest water you’ve ever seen! This is the 4th in the Fear For Sale series, and I am convinced this will be the best yet. The special effects alone are a joy, and the story is pleasantly new and different. This game is a surprising mix of very well done modern normality and absurdly impossible incidents. SIGHTS & SOUNDS The graphics are very bright, clear and sharp, and well drawn. The HOP scenes are easy to see and items are easy to identify. The special effects with water are fabulous. I am particularly fond of the water in the paintings on the walls. The voiceovers are also very good, and it is a shame that such well acted voices have been paired with such wooden faces. The lip synch almost makes it. The music tracks are different and enjoyable for that. The ambient sounds are almost inaudible in the face of everything else going on. All in all, definitely waterlogged. WHAT’S HAPPENING? You are Emma, investigative reporter specialising in paranormal events. You are called in to help a recently widowed father and his young daughter, who seem to be haunted by a poltergeist that can control water. Just how much control is displayed on your arrival, with some surprising happenings outside even your experience. There is also the suspicious death of the mother to delve into. And someone is definitely watching you. What could they want? GAMEPLAY Fairly standard fare here, with more HOPs than puzzles, and easy adventure components. The HOPs are interactive lists, visited twice, but you can choose instead to play a not-entirely-easy jigsaw game. The puzzles are not new, at least none that I saw – I didn’t finish the demo within the hour. The rest is also as expected – interactive jump map, directional hint, 4 levels of difficulty (including custom). There is one whacky gadget. It is a shell which can control water – extremely handy in this game! CE BLING! Wallpapers x 9, Concept Art x 12 (saveable), screensavers x 3, Music x 7. There are of course, also the SG and bonus chapter. There are a huge number of collectibles: 7 sets of 5 items each in collections such as Heirloom Jewellery and Tea Set Collection. There are also 36 morphing objects. There are also 10 achievements, both story and performance. COMBINED IMPACT Two things stop this game from being just a standard CE game. That magic they do with the water, and the sheer scope and variety of the collectibles, which will keep you very busy indeed. As with each game in this series, a good solid game. Rated 3 out of 5 by redvelvetflames from Very disappointed One would think with such a title and description you would be jumping out of your skin. If that is your expectation forget it. At best there is no cliff hanger at the end of the bonus game and there couldn't be one anyway. What I did not understand is you go into the bonus game. In the very beginning daddy dear tells the detective he sent his little girl to grandma's house for her safety. Huh? You have a house gushing water all over the place that appears to be poltergeist activity and that was safe? Then she is smiling the whole time! Huh? Good game if you are bored out of your mind with nothing else to do. Also has a million HOS plays especially in the bonus game. Ugh! Rated 3 out of 5 by swampie from BASED ON DEMO Played the demo and this game is not worth the price even on" tax day" sale today. The added features for this CE, in fact all CEs in my opinion, don't have the content to be worth the CE price. A full chapter, if included in a CE and if said chapter is the same good quality as the game itself, is what I have always considered to be the game's bonus. Screensavers, music, coins, and clothes for bunnies do not a CE chapter make. Played the demo hoping to buy, but...Maybe wait for the SE. Try "VIOLETT". Rated 3 out of 5 by judeejuju from Mediocre I'm afraid I beta tested this game and at that time felt it was a bit so so. The storyline just didn't grab me at all, and I am not a fan of the 'real life' characters, found them all a bit 'ham'. I played the demo and felt exactly the same about the game, for a CE I expect a bit of a wow, this doesn't have that IMO....Sorry. Rated 3 out of 5 by skullfun from Phantom Tide just didn't pull me in... This is the four installment of the 'Fear for Sale' series. I wasn't fond of the story to be honest. Previous editions, Sunnyvale, and Nightmare Cinema really contain 'Fear' in the adventure. I like the real people, voices, and superb graphics of Phantom Tide. In order to progress in this adventure Emma Roberts #you# has to use lots of industrial items like gears, machine parts, repairing a giant drill. More of a construction worker than a reporter. Play the demo and decide. I love the series so much I just bought it; should have waited for SE version. Rated 3 out of 5 by firebird40 from Not as Good as Others in Series... I have all of the other Fear for Sale games and have found them to be fun and challenging for the most part. This one wasn't either scary or fun. The premise of the story sounded promising, but it began reminding me of a bad made-for-tv movie pretty quickly. The live actors just make it cheesy, and the plotline itself was boring and predictable. The puzzles were okay, the music was okay, but the game taken as a whole is just not worth it when there are so many better games out there. Rated 3 out of 5 by steve_san from Phantom Tide Washes Little Ashore You play a detective investigating the apparent death of a woman who saw something strange near a dam, but seems to die suspiciously before she can report it. Her family (husband and daughter) have since been tormented by strangely-acting water, which spews out of all sorts of places, like walls. They live in a house that is literally in the shadow of the dam. Other than the water, which is well-animated and seems to truly have a life of its own, there is really nothing else which stands out about this game. The voices are done well enough, but the drawing falls short. It is really not up to the highest standards. Everything appears almost flat, although colorful. It give the game an older feel, despite the cinematics of the water. Game play is also pretty standard with the exception that you get a special shell that is able to control the water's behavior at times. 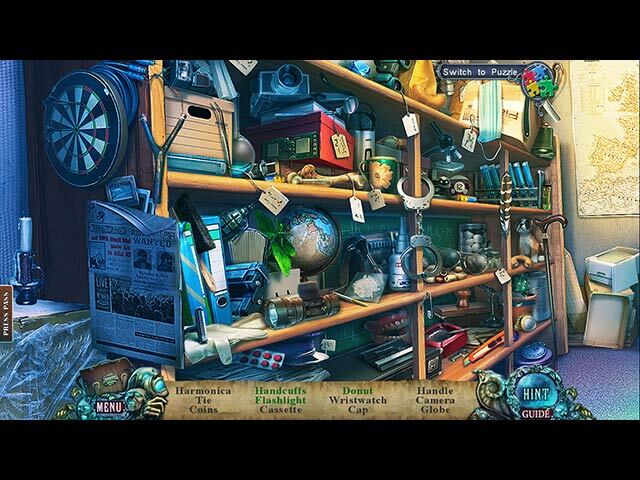 Other than that, there is the usual array of puzzles and hidden object scenes. This is an average, at best, game. I cannot fathom (heh# the good reviews for this game unless there is something I am not "sea-ing" #groan). Rated 3 out of 5 by catbag8717 from You're Getting There Elefun, But You Still Have A Lot Of Work To Do BASED ON DEMO I've never really been fond of this series, or this developer for that matter, so I had low expectations for this game. I did enjoy the game, but I won't be buying it. There were some good elements, but others let the game down a little. The story was one of the good elements. The title definitely lives up to its name. The game is scary! It's a new kind of creepy that sounds like it should be in a Stephen King novel. The story is scarier than most out these days and the demo ends on a cliffhanger, with a really exciting moment. I'm not sure how I'd categorise this story; it's sort of murder mystery/fantasy/sci-fi. All three elements of that are done well. The story does have a couple of twists and turns. One of those was unexpected, but it was the only one that excited me. My only criticism of the story is its excitement level. It was good, but it wasn't great. A little more work and it could've been wonderful. The gameplay was just basic. The usual HOS, the usual puzzles, etc. I'm beginning to tire of the same old, same old. I want something new! That being said, even though the gameplay is old, it was still enjoyable. The HOS were good, and even had a little variation to them. They are the standard junkpile and include extra step objects, but some of the objects needed two extra steps to complete. This was a nice feature to an otherwise plain and simple HOS. There weren't many HOS in the demo. I think I counted about three in the forty-five minute period. For a hidden object game, there weren't many HOS! I would have loved to see a few more HOS in the game. The good news is, for those who don't like HOS, there is the alternative of a puzzle. I personally did not like this new feature, but that's only because I'm not very good at them. For those who prefer puzzles over HOS, this is the one for you! The puzzles were also nothing new. They were what we'd seen before. For once, the puzzles were actually pretty easy. I was able to solve all but one, I believe. Those who are expert players will be annoyed at how easy they are, but I enjoyed them. I think the ratio of HOS:Puzzles was good. There were a few more Puzzles than HOS. Those who like HOS a lot may be annoyed at this. There is one new feature in this game, which I was pleased about. This is the “water shell” which has the power to control water. It can get rid of it, or create it, which saves a lot of time having to run around collecting buckets of water when trying to put a fire out (or whatever else you do with water). This is a really nice feature. It is not used often, which makes it better. There's nothing worse than a new feature being over-used! As well as this, there were some collectible tapes, which is not necessarily new, but it was still enjoyable. These tapes documented the time before Julia's death and were a great addition to the mystery. Other than that, this is your standard HOPA. It's got a custom difficulty (new for this developer, I believe), diary, map and all the other standard features. I really do want to see something new! I hope the developer takes this on board... New gampelay= happy Catbag! The graphics are good. Elefun uses real people instead of cartoon people in the game for the first time. This is limited to a couple of cutscenes, however. The scenes and HOS are all clear and drawn with some good detail. Overall, a good job from the developers. My main issue with the game is with the voices/music. The music was really, really annoying. It was just ruining my experience with the game. So much so, I turned it off about 20 minutes into the demo. The worst music was when you collected a collectible, and when you entered the bonus content section in the main menu. This rock music started playing. I love rock music, but here it was out of place and annoying. My next issue is with the voice-overs. Firstly, I found the voice of the girl (Katie) rather annoying and whiny. Secondly, I hated the voice of Mr. Taylor. The voice-over was emotionless and boring and almost put me to sleep. The voice-artist seemed bored when he did it. Bad voice-overs are small problems, but they do drag down the fun rating of a game. FEATURES 4 modes of difficulty: Casual, Advanced, Hard and Custom. Custom lets you set the game the way you want it, although this is limited. Differences in difficulties are the usual. I played Casual. Hint and Skip- both recharge at a reasonable speed for the difficulty. Hint is useful outside HOS. Diary- used to keep track of events. Used quite often. Collectible tapes- sort of like a backstory: documents the time before Julia's death. Water shell- Has the power to control water; can create or get rid of it. Very good feature. Not used often. Map- the map is interactive and helpful. It lets you know where available tasks are. CE EXCLUSIVES Achievements- these gave you “points”, which was annoying and useless. These points seemed to have no value. Collectibles (35)- There are seven sets of five collectibles. This is a lot for a game. Again, these gave you “points”, which I hated. Bonus Chapter- unsure if needed. Strategy Guide- helpful for puzzles Concept Art Wallpapers- a lot more than usual Screensavers Music Overall, I think this game is getting there. It's not overly terrible, but it's not fantastic either. It's one of those average games. A lot of work needs to be done in order to put this developer up there with some of the great ones. I'm not going to purchase this game, but I recommend that those who want to should wait for the SE. I did not care for any of the CE extras and do not see it as worth the extra money. Elefun are yet to blow me away. Here's hoping that'll change in the next game... The best I can do is three stars. I still recommend you download the trial though. Rated 3 out of 5 by agbosche from Not My Favorite Game I may be in the minority but I do not like games that have "real" people in them. It creeps me out. That was my only complaint. The graphics are good, music was turned way down so that wasn't a factor, voices were good, etc. This review is based on the one hour free play. Rated 3 out of 5 by Torpedo1 from Three and a half Stars This game bordered on being fantastic. It was fun and had plenty to do. I am glad I played in normal mode and not an easier mode. The music was great and the scenery was very nice. It is for me a easy breezy game. The HO's were good and you could switch to a puzzle if wanted. It has a jump map to help with the back and forth which was not too much of. Characters were ok. Puzzles fairly simple. I ran out of time on a puzzle that was promising to be more difficult. There were two types of collectables. I think one was morphing objects the other was a bit confusing to me, but I think associated with the dam or water. I will put this on my buy list. Rated 3 out of 5 by nontechiegrannie from Sorry Fear - NO Sale or 5 Stars Based on Demo. Another game with undeserved 4/5 Star rating. When do the rose colored glasses come off & games are seen for what they really are? Also, I find retelling the story in the review REDUNDANT. I just read the synopsis that BF provides as that is all that is needed. The rest you find out when you play the game. Same old, same old rehashed story line. I didn't find this game scary at all just boring. Horrendous, itsy, bitsy, tween, weeny (no yellow polka dot bikini# junk pile to sort through. I prefer HOG so I don't do puzzles or Match 3. #I still have figured out the purpose for this childish game#. The graphics/characters/vo were actually not to bad. The music was not much of anything. Didn't seem to enhance a "scary" story. The hint filled nicely & I actually liked the map! The collectibles were a little annoying as there was no rhyme/reason to them. I like to click randomly every so often as I find things strictly through PDL. #pure dumb luck) It's just another game like so many others that have been coming out lately. I wish the devs could come up with some new, ORIGINAL ideas & stop relying on rehashing games over & over & over etc. Rated 3 out of 5 by lucygirl7 from made me yawn I absolutely could not get into this game. the story line was great, but it was so slow, too many collectibles, and just plain boring. I can see that everyone liked this so far, but me. With all the great games that are coming out, this just didn't make the list. Rated 2 out of 5 by spicegirl479 from Not feeling this one. This game has great crisp visuals BUT I just didn't get into it..I found it quite dull. Rated 2 out of 5 by ushina from I feel cheated This would be a good game, but it doesn't deserve more stars since those developers cheat us with the amount of those Brain-killing HOS. In the Demo they are still too many - but not overcrowded, after you buy the game they throw in one after another and that kills the whole game! Please more Adventure and less HO junk piles.